The hardest worker you have tending your garden is the one who starts at the crack of dawn and quits when the sun goes down, doesn’t need direction, is tireless in his pursuit of keeping your flowers blooming and your fruit fruiting, immigrates across borders and is happy to work for FREE–which rhymes with–BEE (meli in Hawaiian). 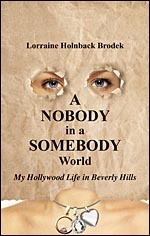 In my book, A Nobody in a Somebody World, the third chapter is titled The Savage Bees. Husband Tom supervised production of this killer bee flick back in the 80’s when there was a wild frenzy going on about angry bees crossing our borders bringing venom and viciousness with voracity (the three bee “v’s”) as they targeted their prey. 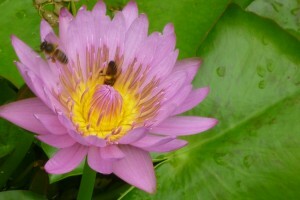 Fortunately, we have always had contented, busy bees to keep our Maui garden humming..so to say. No worries about their having a ho’omainoino (mean) streak. That is..until the other day when the menfolk started running every which way and screaming like womenfolk. 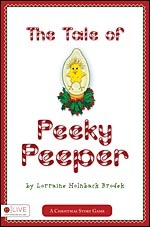 Their voices went into the high decibel frequency range..”Ee-eeee-ee!” Also rhymes with bee. There are a few things that normally happy bees don’t like. They don’t like noisy weed-eaters. They don’t like swinging machetes chopping and they definitely don’t like their hive poked with a stick. When all three of these things happen at the same time, it’s like living in Oakland and the drones pull out the big guns and go on the attack. That’s when we realized we had a hive in the ‘hood. We didn’t know that. 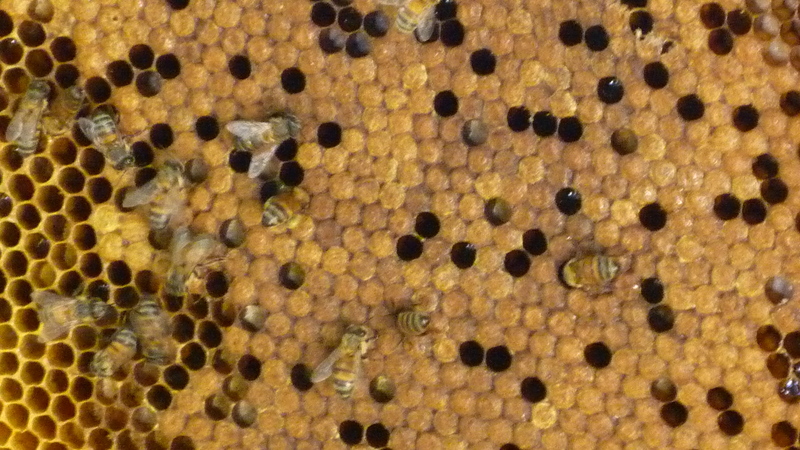 The Queen decided that she’d set up light housekeeping and/or beekeeping by our #4 water tank. The prime real estate she selected was the box that also houses the pump..warm and cozy with a great view. Bees are a valuable commodity here on Maui where flower farms abound, waterlilies float leisurely in the ponds, all manner of tropical fruit is abundant and the macadamia nut trees produce like crazy. Another great benefit of this is the Hawaiian practice of sharing and/or bartering. We just traded our limes and lemons with our neighbors (Eileen and Rene of Hana Herbs) for Rene’s fresh fish (Ahi) of the day. A win-win! 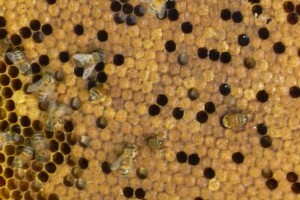 So preservation of bees is first and foremost. Obviously our hive had to be moved to a more remote area so that the human menfolk could claim their space back and have fun with their tools again. It was time to call Ken. 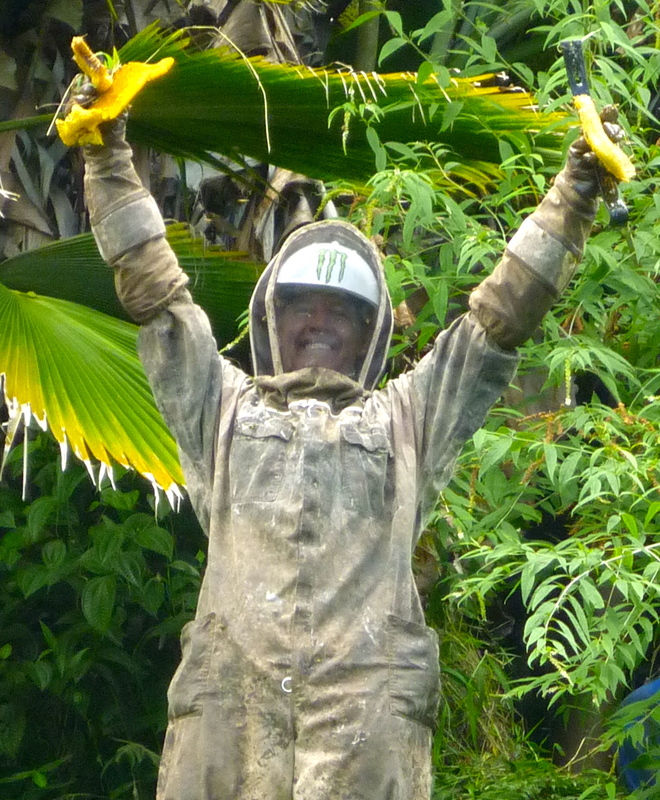 Ken Darr loves bees! Nothing makes him happier than a healthy, thriving hive with glistening, oozing honeycombs inside. He also harvests delicious honey, which provided a sweet bee benefit for removing our swarm. He arrived in his pickup ready to collect his new group of productive little farm workers. Hundreds of ’em..all energized and pumped up at the pump box. 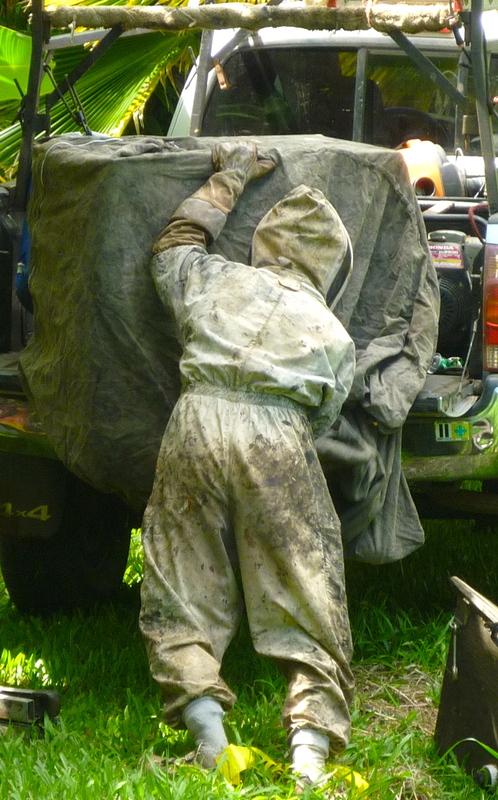 Of course a heavy zip-up bee suit is the first requirement for retrieving bees, including long thick gloves and a sturdy mesh hood for head protection. Ken kinda looked liked a dirty astronaut. Personally, I don’t think he has ever washed his bee suit..but bees don’t care about that stuff. However, it would be the supreme test to see if Tide Ultra Stain Release really works. Now that I think about it, you wouldn’t want a super good beekeeper to arrive in a squeaky clean bee suit. None of us realized the magnitude of Ken’s challenge. 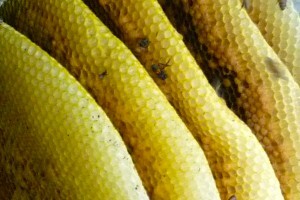 When he lifted the box lid, it was determined that the queen was really popular and her staff had created lots and lots of honeycombs–all yellow and thick. 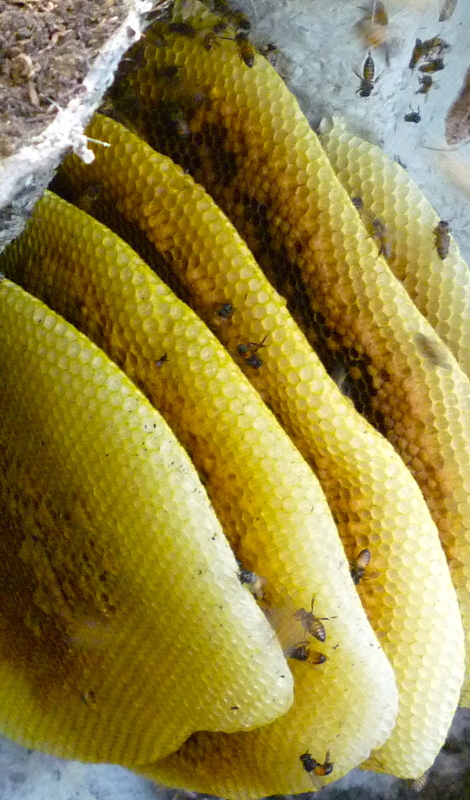 Like about 100 pound’s worth of bees, combs and goo. The easiest solution was for Ken to just take the entire box. Fortunately, he’s a strong guy–plus now he was as pumped up as the bees for finding such a liquid gold treasure trove for his honey business. He wrapped the box with a tarp to contain most of the residents and calm them down. Then he lifted the box and loaded it into the back of his pickup. Last we saw of Ken, he was headed down the jungle road, with straggler wanna bees following close behind as they all headed off to a quieter neighborhood. I was thinking what a great thing it is to have a live bee hive in your truck. That way you don’t have to have a car alarm or a wheel lock. Or you don’t have to worry about someone parking too close to you and dinging your doors at Walmart. Or you don’t have to worry about the cops pulling you over for an expired safety sticker on your bumper. That’s a must-have here in Hawaii. 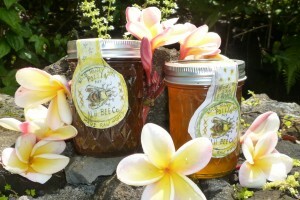 My first decision of the day is whether to have Ken’s macadamia nut wild honey or his Happy Valley honey on my toasted bagel. 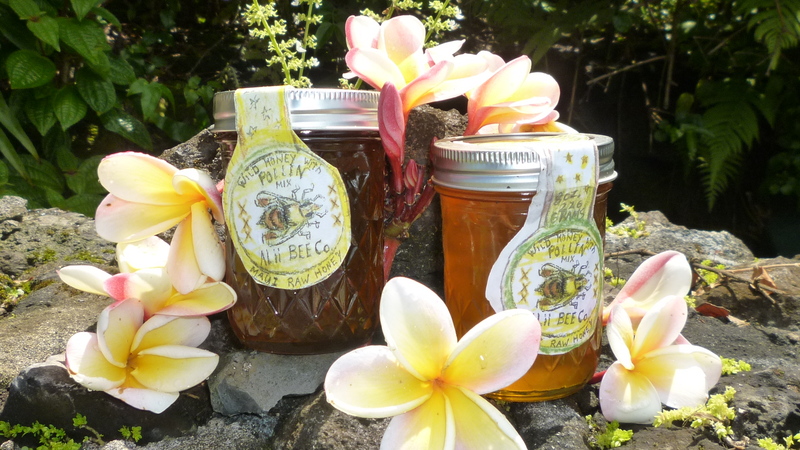 Obviously “our” bees are happy and contented in their new digs and Ken’s Alii (appropriately that’s Hawaiian-speak for Queen) Beekeeping business should be a buzz of activity.